The version of the browser you are using looks outdated or not supported; this means that Telstra My Account may not display correctly and some features may be unavailable to you. We recommend you update your browser. Download the latest Internet Explorer, Google Chrome, Mozilla Firefox or Safari here. We are improving the My Account experience. Click here for more info. Your Telstra ID may be the email address you receive your bills to, the email address you provided when you created your Telstra account, or your BigPond email address or username. What's this? Your username will be remembered on this device for some time. Please leave this unchecked if you are using a shared device. Don't have a Telstra ID? More Telstra 24x7 benefits Why register? Catching public transport, sitting in a cafe, or chilling out on the couch at home - now you can manage your personal Telstra accounts and services when you choose. Customer feedback: "Simple, quick, easy to use!" 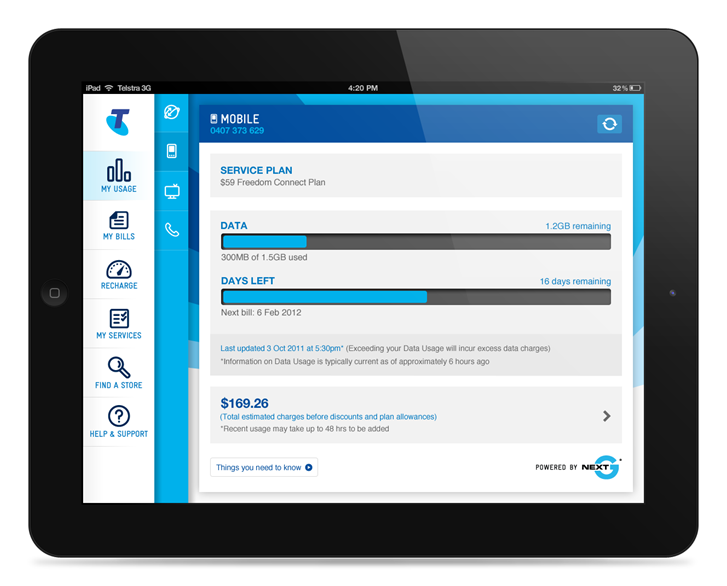 Additional information on the Telstra 24x7 App for iPad ("App"): (a) Telstra provides the App on the terms and conditions in its End User Licence Agreement; (b) The App is only available to customers with an Apple iPad that runs iOS 4.3+; (c) The App currently only supports Telstra Personal customers; (d) Standard data charges apply to download the App. Telstra Next G® mobile customers will not incur data usage charges for viewing or using this App unless roaming overseas, using the Store Locator with maps turned on, or accessing help and support via Twitter and Facebook. Apple and iPad are trademarks of Apple, Inc., registered in the US and other countries. Twitter is a trademark of Twitter, Inc., and is used under license.